with Fragmenttation! Meteorites may have survived?! - with unconfirmed videos! It has been determined that the event was caused by the re-entry of a rocket body. Dr. Rob Matson writes, "
Published on Jan 16, 2014 - My comment---Video faked or altered??? Report your meteor sightings please-تقرير مشاهد النيزك يرجى العربية يرام! updates pending as more reports come in. 16JAN2014 Ahmed Jamalullail Jeddah 23:10:00 Over 20 sec Looking towards North, Starts from NW to NE blue-greenish/no sound venus and blinking while breaking apart parts may have fallen towards east side to Jeddah's airport Video taken but show shiny dot as we were driving in the city. 16JAN2014 Rainier Vargas and family Jeddah, thaliyah cor Malik road past 11pm 30-40 west to east direction. white with touch of blue venus bright breaks into more fragments no photo or video taken. Saudi Arabia arrived on "Latest Worldwide Meteor/Meteorite News: Breaking News- Ireland, Isle of Man, UK Fireball Meteor 15JAN2014". 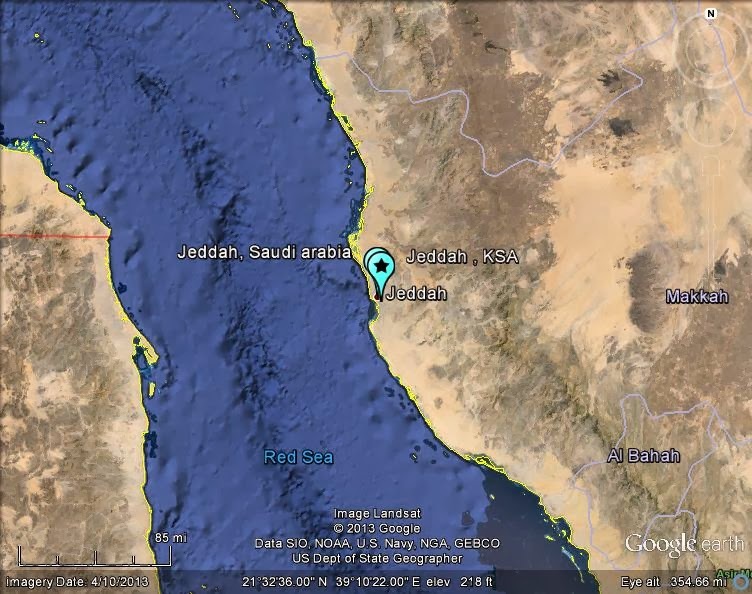 Jeddah, Makkah arrived on "Latest Worldwide Meteor/Meteorite News: The Latest Worldwide Meteor/Meteorite News 16JAN2014". Astronomical Jeddah:" register "fireball" western"
...space object atmosphere may be a stone Nizquia large or asteroid was young, when at about 23:00 local time, according to preliminary estimates, this offense Space reached a diameter of about nine meters, and weighs about 1,000 tons metric, and fell angle between about 15 and 20 degrees at about 55,000 kilometers per hour, and left behind a trail of dust extended for a distance of over 300 kilometers.. use Google Translate!